Clearly, this is not Accessory Thursday. This, “Hey it’s a dress” Thursday which, I will confess, does not roll so smoothly off the tongue. I put the accessories, which were shoes, on Monday with the doll, because they were NOT very interchangeable among the various Marisole Monday & Friends. I am soliciting opinions about this decision in a poll below. One way in which this week’s dresses have diverged from my other dress is that I didn’t have a specific color scheme in mind. I tried to stick to colors that all sorta went together, but I didn’t start out with a clear plan. Since I am spreading things out over a week, I don’t feel as beholden to a color scheme as I once did. 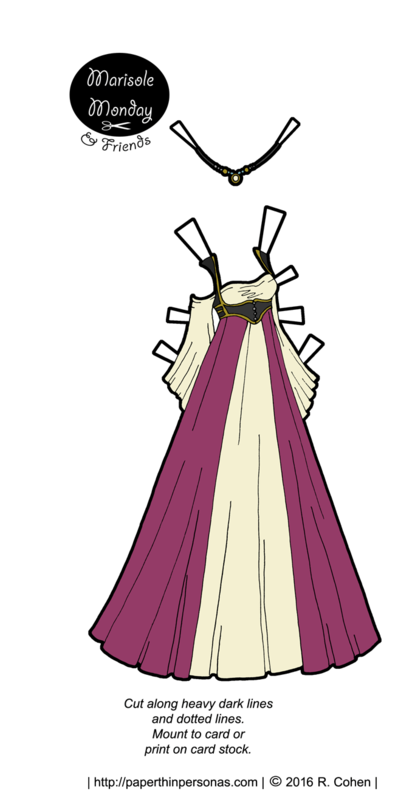 This paper doll gown is actually the design that inspired the whole set. In my head, the vest she wears has the long skirt attached to it and is made from a thick black velvet trimmed in gold braid. The berry pink fabric is a heavy cloth, but the cream fabric is softer. Her circlet is made from soft leather with decorative beads. I intentionally made it longer on the sides, so that you can adjust it to the dolls head as needed to get a good fit. If you missed her, here’s the doll from Monday. By the way, just out of curiosity, I have a poll about Accessory Thursday. Do you miss Accesory Thursday? Honestly, I don't really care. Tomorrow, there’s an elegant teal gown and, as usual, the round-up of the whole set of printable paper dolls for your ease of printing. As always, I love to hear what people think in a comment. I think this is my favorite gown of the set so far! The colors are so bright and feminine and I love the contrast.